IBM researchers and Fujifilm have outdone themselves again. In partnership, the companies have managed to cram 123 billion bits of data per square inch onto a tape storage device. In May, the two companies said they had figured out a way to store 85.9 billion bits per square inch, or 154 terabytes, onto a tape storage prototype. Today’s announcement introduces a unit that can hold 43% more data than the previous model. 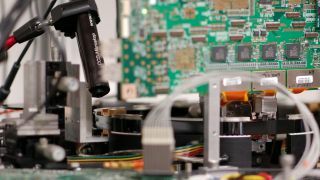 With the new standard, IBM can now squeeze 220 terabytes of data onto a cartridge that can fit in the palm of your hand. As IBM pointed out in a statement, that’s the data equivalent of the text of 220 million books. Today's industry standard tape product, the LTO6, holds approximately 88 times less data than the latest IBM and Fujifilm prototype, so expect to pack more information onto smaller storage architectures as the days progress. That’s if you don’t simply move all your data to the cloud. For many businesses, tape is the preferred method of information retention, as it offers 15 times lower total cost of ownership than high capacity disk drives. However, cloud storage is becoming increasingly cheaper, more secure and faster to backup and recover, which is why enhancements such as the one IBM is announcing today are so important for fans of tape storage. IBM has also been conducting similar research with Sony. Earlier in the year, the two companies teamed up to launch a tape prototype that can hold up to 185 terabytes of data per cartridge by using a sputter deposition technique that prevents magnetic particles used to store data from growing beyond a certain size. However, the IBM-Sony prototype is more expensive to replicate and is likely to attract fewer adopters than the Fujifilm prototype.